After becoming the first private company to dock at the International Space Station 9 (ISS) earlier this year, SpaceX has dispatched its Dragon capsule to deliver supplies to the ISS under contract from NASA. BBC reports that Dragon is carrying “400kg of food, clothing, experiments and spares” to the astronauts at the ISS. The capsule is scheduled to dock at the station on Wednesday. SpaceX has signed on to fly at least 12 resupply missions to the ISS for NASA. The Dragon, which SpaceX touts as the only spacecraft capable of bringing a “significant amount of supplies” back to earth, will be hauling back scientific materials and space station hardware on its return flight. 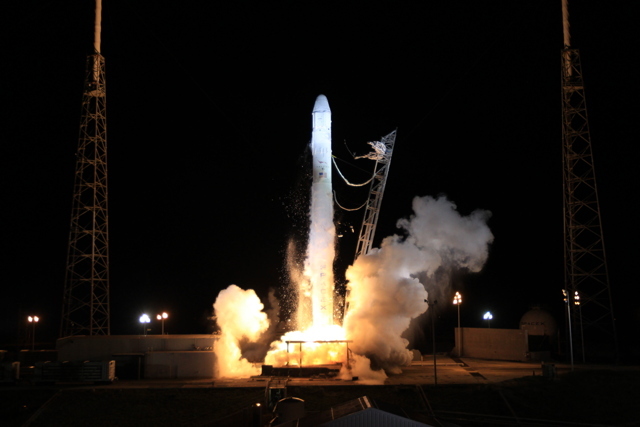 In May, we reported that SpaceX has a backlog of about 40 launches, worth about $4 billion. The company has as many as 29 missions planned through 2017. NASA is also pursuing a contract with Orbital Sciences Corporation, another space-bound company that is looking to deliver cargo to the ISS. Musk has aimed for the stars and commercial space flight is becoming a reality. It’s a great time to be alive, I’d say.